As a kid, I would get so excited when my mother made breakfast food for dinner! There was just something exciting and extra special about having bacon, eggs and grits at night. I know now that my mother was making breakfast at night because she was simply tired and couldn’t muster the energy for anything else! But, to this day, I still love to eat eggs at dinnertime. To continue with the inspiration from the tapas cooking class, I made this version of a “tortilla española”, which is a classic Spanish dish made of sliced potatoes, onions and eggs. 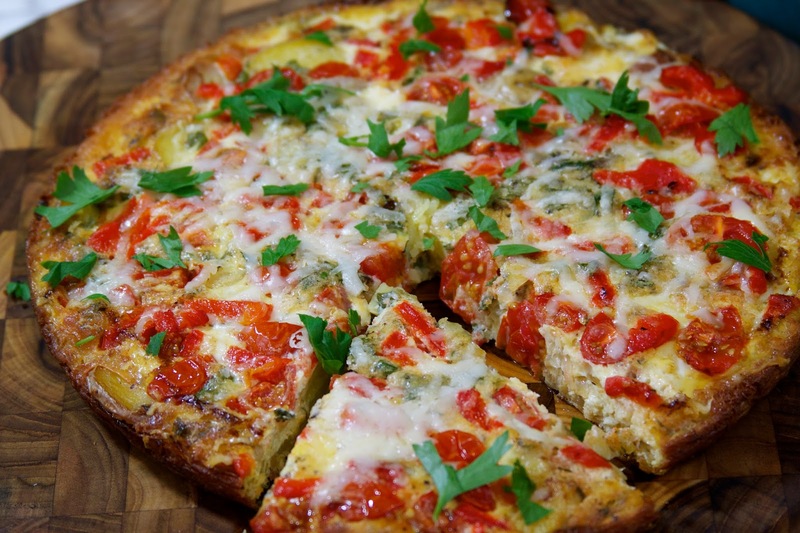 It is very similar to a frittata, the main difference being the technique in which the eggs are finished. 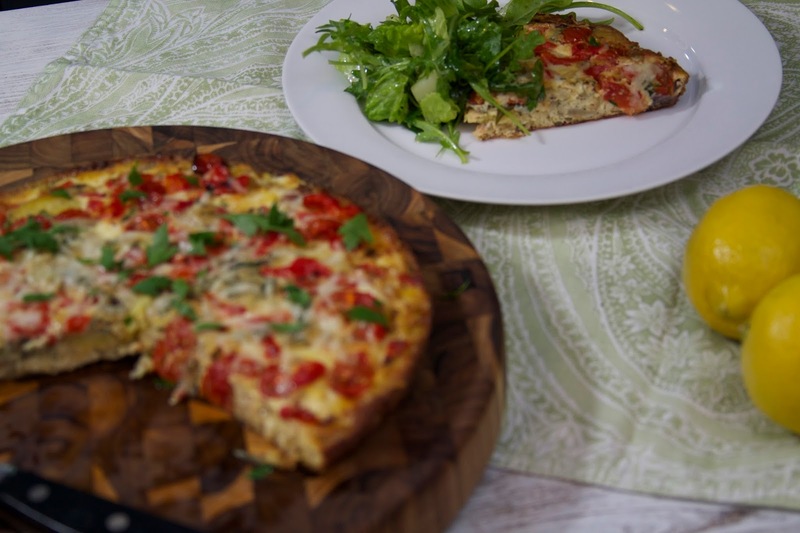 Both dishes consist of eggs and filling cooked in a frying pan on the stove, but a frittata is finished in the oven, whereas a tortilla española is flipped over so that the top of the eggs are finished in the frying pan. Because I didn’t want to risk possible disaster trying to flip the tortilla over in the pan, I have made a tortilla española that is finished in the oven like a frittata. Less mess and less chance for disaster to strike! What’s also fun about this dish is that you can be creative and add whatever filling suits your fancy. Thinly slice the potatoes and cook in boiling, salted water for about 7-10 minutes or until they become tender but still hold their shape. Be sure to generously salt the water, as this is an opportunity to season the potatoes. Drain the potatoes when they are done. In a non-stick frying pan, add about two tablespoons of olive oil and turn on medium heat. 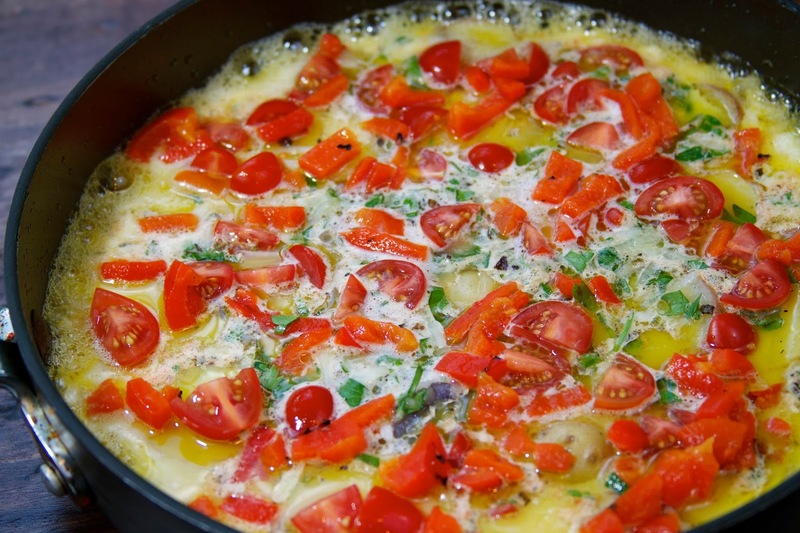 Be generous with the olive oil, as the oil will allow the eggs to slide out of the pan more easily. Add the sliced onions and sauté until the onions become translucent. Add the potatoes and continue to cook for about 5 more minutes. 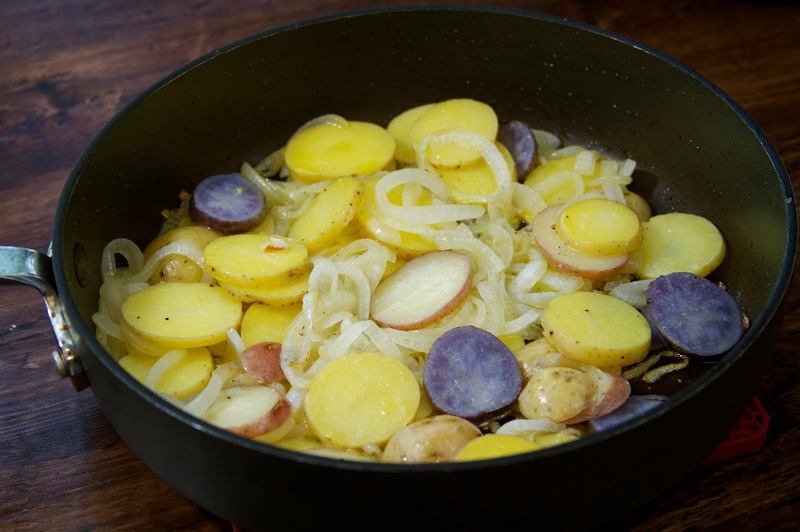 Don’t allow the potatoes to brown–you just want them to thoroughly cook and absorb the olive oil. Season the onions and potatoes with a little salt and ground black pepper. 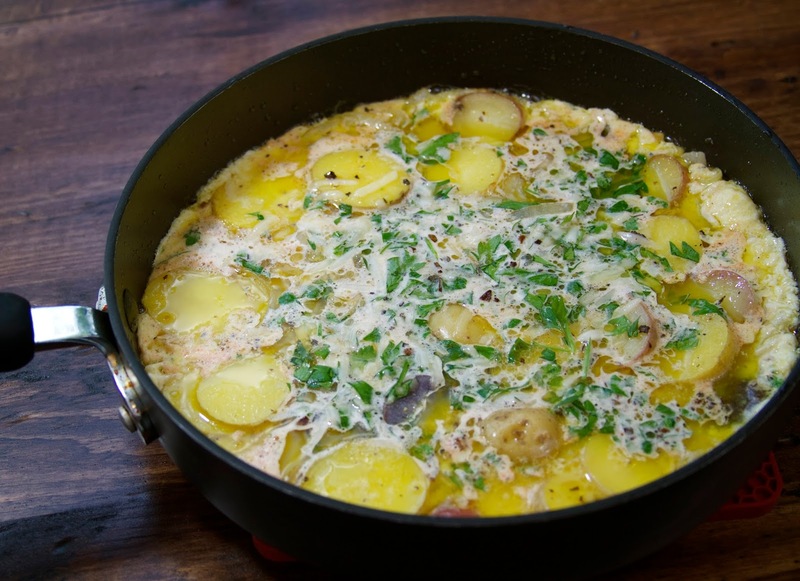 In a medium bowl, whisk together the eggs, parsley, salt, pepper, smoked paprika, manchego cheese and lemon juice. 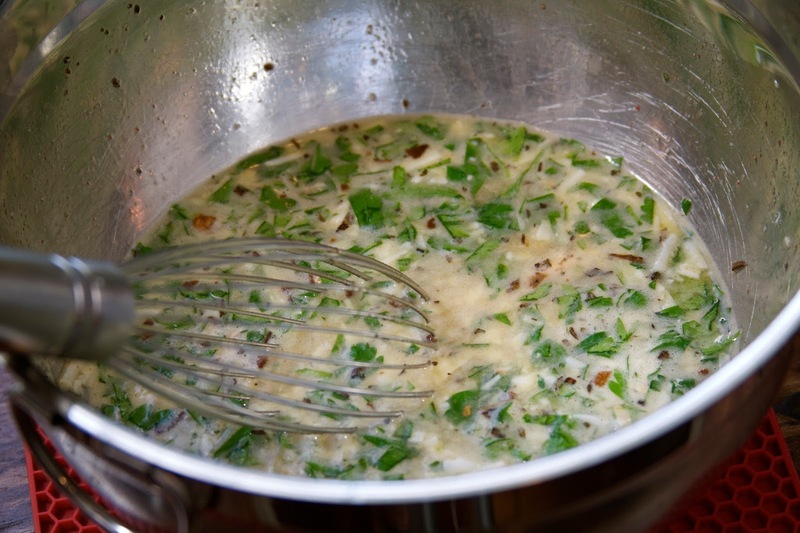 Pour the egg mixture over the potato and onions in the frying pan. Tilt the frying pan until the eggs evenly cover the potatoes. Cook on medium heat until the eggs are set around the edges. At this point, I sprinkled chopped grape tomatoes and roasted red peppers on top of the egg mixture. Place in the preheated oven and cook until the eggs are completely set–about 30 minutes. In the last 5 minutes, add a sprinkle of manchego cheese and cook until melted. After the eggs are completely set, allow the tortilla to cool for at least 10 to 15 minutes. If desired, after the eggs have rested, take a plate and cover the top of the frying pan. Flip the tortilla out of the pan and onto the plate (it will be upside down), and then flip the tortilla right side up onto a serving plate. You can omit this step altogether, if you prefer and just slice and serve the tortilla from the frying pan. 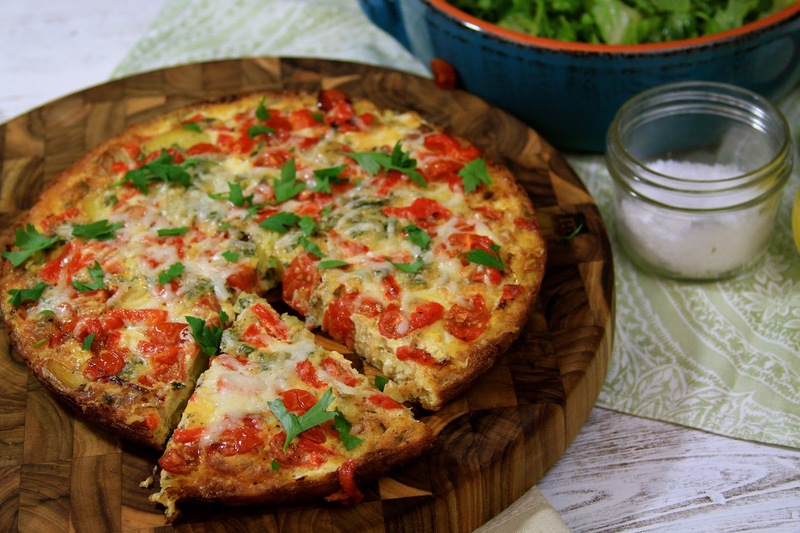 I served the tortilla with a simple arugula salad and it made a great light dinner. This dish would also be fantastic for brunch as well!